We have a lot of information to share this month. At the top of the list, there will be a Public Meeting about the Aqua Virginia situation on Feb 22, 7 pm at Sparrow Road Intermediate School. This long running issue impacts the water supply for the residents in the neighborhoods around Sparrow Rd (between Indian River and Providence Rd) and also the ability to revitalize the Indian River Shopping Center. Please attend this meeting to learn the current status and help emphasize the importance of resolving this matter. - Mar 4 - Field Trip to Back Bay National Wildlife Refuge - Free for members; $8 for non-members - this trip is almost full, so please RSVP now if you are interested. Our guest speaker will be Ray Wicker of Wicker's Crab Pot Seafood. He'll talk about the life of watermen and harvesting crabs on the Indian River. We'll also be holding elections for our officers and board (postponed when January meeting was cancelled) and briefly discuss plans and priorities for 2018. There will be light refreshments and door prizes. It is the weekend of the Great Backyard Bird Count, a worldwide effort to identify the distribution of birds. 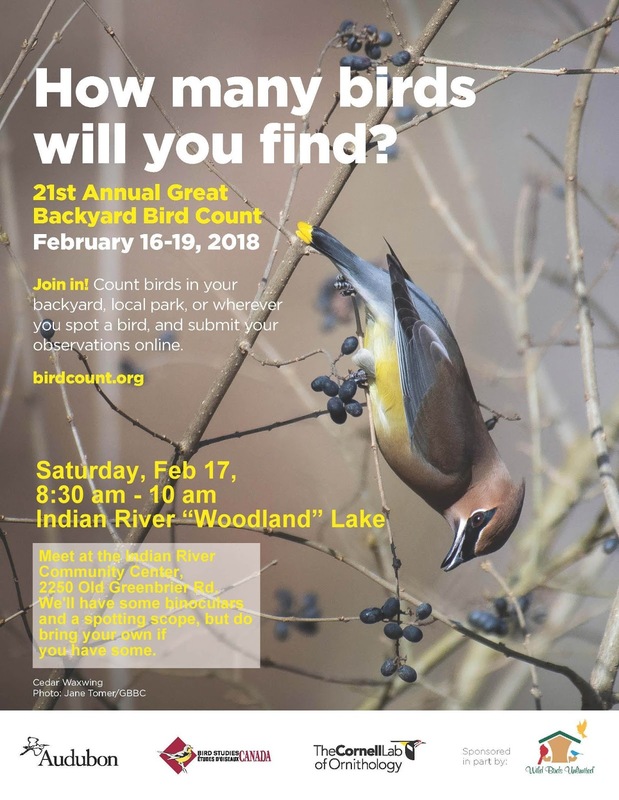 As part of this we'll be leading a guided bird watching walk around the lake between the Indian River Community Center and the High School. Novices welcome. When scouting the site, a variety of birds were spotted including Cormorants, Mallards, Pied-Bill Grebe, Bluebirds, - Yellow-Rumped Warblers, Woodpeckers, and more. We'll have some binoculars and a spotting scope, but do bring your own if you have some! Please come to this public meeting with the City of Chesapeake concerning Aqua Virginia and the Indian River Shopping Center and please help spread the word and get your neighbors to attend. Over the past year, the City and Aqua Virginia have been negotiating a proposal that would have the city establish a cross-connection between the City and Aqua Virginia water systems. We saw the outlines of an agreement as early as last June (see https://drive.google.com/file/d/0B1C5n48ReRbkZGJrVnJwclpUWVU/view). This deal would also enable revitalization of the Indian River Shopping Center. But as of January the deal has not been closed. Please attend this meeting to learn the current status and help emphasize the importance of resolving this matter. The outcome of the meeting will also help us formulate next steps that we can take as a community. The Friends of Indian River is planning Field Trip to Back Bay National Wildlife Refuge on Sunday, March 4th. We will take the Back Bay open-air tram tour through the refuge to see the wetlands and ponds normally off-limits to visitors to protect the over-wintering waterfowl. Bring your camera and binoculars! We'll meet at 11:30 am to carpool to Back Bay; the tram tour is from 1 pm to 4:30 pm, so we should be back here around 6 pm. *** The trip is free for members (and immediate family of members at the Family level). For non-members, the cost is $8 per person. Space is limited and the trip is filling up fast. If you are interested, please RSVP by replying to this e-mail. We were extremely honored for the Friends of Indian River to recognized as an Elizabeth River Project River Star Business at the Model Level. This is their "best of the best" designation for organizations leading in environmental stewardship. And as an all volunteer organization, we couldn't achieve this without your support and volunteer efforts, so we say Thank You to all of you! Also, congratulations to Oaklette United Methodist Church for becoming a River Star at the Achievement Level. Thank you to the nine volunteers that came out for our English Ivy effort at Indian River Park in January. We freed many trees that day and hope to get more done at our February 24th work day. On January 16th, the City Council continued - delayed any action - on the a proffer change for the proposed condos next to Indian River Park at the south end of Miller Avenue. While we have no position on the proposed technical change on these proffers, the Friends raised the fact that this development would require various mitigation actions in Indian River Park. The Council asked for a work session with City staff on February 13th to review the overall development proposal. Also on January 16th, the City Council unanimously approved an ordinance change to disallow Computer-Based Gaming establishments in the city.